Padding on the seat, mesh on the back, with a supporting headrest up top, the Eurotech Apollo MM95SL Mesh Chair with Optional Headrest brings the best in ergonomic seating to the table. New and improved controls let you adjust the height and amount of lumbar support for more comfy seating, your way. Built-in synchro-tilt keeps your chair angled ideally, with height adjustments being done pneumatically and easily, letting you get back to work. The Eurotech Apollo Mesh Chair can be customized in your choice of fabric to keep you working in style. Upgrade your current seat and feel the difference in comfort that better back support can give you with one easy addition to your work style. The Raynor Eurotech Apollo MM95SL Mesh Chair is available with a black mesh back and black seat, or your choice of any of these custom fabrics on the seat at a small upcharge. 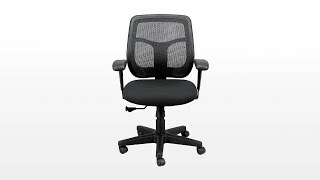 The Eurotech Apollo MM95SL Mesh Chair is available with or without a headrest. $321.00 List Price: $562.00* The list price is the same as the MSRP (Manufacturer's Suggested Retail Price). It may not necessarily be the price at which the product is sold.